1) Plug-in electrics are inconvenient: a plug-in can only go a few hundred kms before it must be recharged, whereas gasoline-powered cars have a virtually unlimited range as long as you keep on filling it up with gas. This misses the point on two areas: a) it's a bit of a stretch to say that plugging in one's car at home is more inconvenient than filling up at a gas station. It certainly takes longer, but the time spent charging is done when you are at home and are likely busy with other things, so the only inconvenience involved is the effort required to put the plug in - not that big a problem. The issue about range is also solved with a car like the Chevrolet Volt, which uses electricity at first, and eventually switches to a gasoline-powered battery recharger after about 60 km, guaranteeing the same range as a gasoline-powered car. In short, those that expect to drive only up to a few hundred km a day can go with something like Tesla/Think/etc. while those that want a car that can still do a road trip can go with the Chevrolet Volt. 2) Electric cars simply divert the environmental impact: this is a myth that just won't seem to die. Sure, electricity does have to be created from other sources, but even when electricity is produced entirely from coal the environmental impact is much smaller than with gasoline. This is a very important point. Adding to this, electricity does not necessarily need to be made from coal - many countries use hydro (Norway), geothermal (Iceland), nuclear (France), wind (Denmark), and various other sources to make electricity. Also, once cars have moved over to the electricity grid it becomes much easier to change them into completely zero-emissions vehicles, because it only requires a change to the source of electricity, rather than a retooling of the car itself. Finally, since pollution from power plants is usually created outside urban areas (where most people live), the health benefits are enormous. No more breathing in car exhaust when walking down the street. Finally, one more point: battery technology continues to develop, and with this comes greater and greater range. Tesla's S Sedan will have a range of almost 500 km, which is good enough not only for commuting, but also for a small road trip to one city and back. Add a recharge in the city (let's say you have a business meeting there - go to the city, plug it in, finish the meeting a few hours later, get back in the recharged car and go home) and you can easily make a city 400 km away. Already the only thing you can't do with this car is a marathon road trip. Eventually the range of an electric car will reach such a high level that there will be no reason whatsoever to stick with gasoline. Saying that electric cars aren't the future because they have a limited range is like saying that computers aren't the future (in 1990) because hard drives can only store a few megabytes of data. In other news, there's a blog here by the first driver to try out the Mini-E (the electric Mini Cooper). Definitely keep an eye on that. 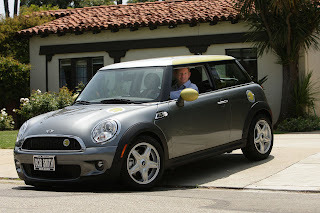 The Mini Cooper is my favourite gasoline-powered car, so if it goes electric then I'll definitely want one of my own.